Learn what sets Egnyte apart from the crowd. These distinctive Egnyte features are crucial for your business to run efficiently and productively. 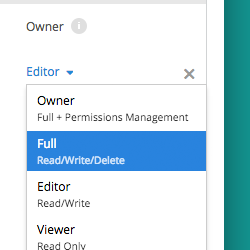 Modify or deny permissions at any level of the folder hierarchy. Granular permissions enable customers to organize their data in ways that replicate existing on-premises permissions. 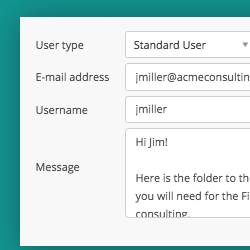 Create folders for groups in the organization and sub-folders for specific sets of sensitive data. Work on your files without using your local hard drive. Egnyte Connect Desktop App allows users to continue working on their desktop while files are stored in the cloud. You can even sync folders for offline access so you're never without important files. Sync your on-premises storage and access your content anywhere. Enable secure, controlled collaboration with external parties. Standard Users are created and managed as part of your account, enabling secure collaboration with outside parties. Collaboration takes place fully within your Egnyte account, ensuring that admins have complete visibility over all content. Monitor account activity with detailed audit reporting. 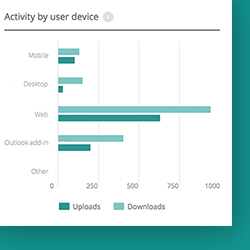 Monitor usage and behavior with real-time auditing of users, data, and activity across the entire Egnyte platform. Access files, upload photos, and edit files right from your mobile device. The Egnyte Mobile App allows users to work on files and add content while away from the office. You can even share files and folders without ever leaving the app. Deeply integrate Egnyte with key productivity tools. Egnyte offers seamless integrations with partners such as Google Apps, Microsoft, and Salesforce to increase productivity and support a variety of user workflows. Automatically edit files in their native applications from our Web UI. WebEdit allows users to open and edit files directly from the browser, saving time and maintaining versioning with Egnyte. Track updates to your content with the Activity Stream. The Activity Stream in the Web UI and the Egnyte App scopes to whichever folder you are in, showing recent file actions like uploads, deletions, and comments. Share files and folders securely with links. Protect your shared links by setting an expiration (date or click-based), preventing downloads, or restricting content to account users only. You can also track link views and request a notification upon link receipt.